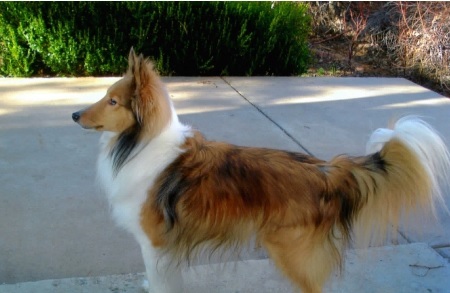 Nicki contacted me in mid-April about talking to her dog, Bobby (also known as Coyote Bob) — a beautiful Sheltie. I’d talked to Bobby and Nicki’s other animals (including the domestic rabbits she rescues) several times in the past. This time, however, the purposed of the conversation was much different. Bobby had been diagnosed with terminal liver cancer in early April. The vet felt Bobby would only have a few months to live. Nicki wanted Bobby to be as comfortable as possible for whatever time he had left, but she was concerned that Bobby was in pain. When we talked to Bobby, he felt like a very, very sick dog to me. Bobby did not show me that he was in pain, but he did feel significant pressure in the area of his liver that was very uncomfortable. Bobby was also experiencing vomiting, poor appetite and panting at night and during the day. Bobby showed me that his energy level was low as well and his body felt extremely thin to me. Nicki confirmed that the physical symptoms Bobby had showed me were what she had observed. Bobby showed me that the day time panting was often due to feeling overheated — even in an air conditioned house. It felt to me that this was related to his disease process. But it was the panting at night that Nicki was most concerned about, since she felt Bobby was in pain. When I asked Bobby to show me how he felt at night when he was panting, it felt like the panting was anxiety related because Bobby couldn’t get comfortable due to the pressure in the liver area. There didn’t seem to be any position that Bobby could lay in — or anything he could lie on — that was comfortable for long. It seemed that while the pressure bothered him during the day, it wasn’t so bad because there were things to distract him and take his mind off the discomfort. But at night, it was a different story . . . there was nothing to distract him and he focused more on the discomfort. I suggested that Nicki try giving Bobby Rescue Remedy at night to help his anxiety and to help him relax and sleep better — she could give him additional doses during the night if needed. Nicki said she would do that. She said she also had prescription pain medicine and Prozac that she could give Bobby. I suggested she start with the Rescue Remedy and she could always add the pain medication if needed. We asked Bobby if he felt the Prozac helped him be calmer (she’d given it to Bobby per the vet for several months) but Bobby said it didn’t help with the anxiety at all, so Nicki stopped giving it to him. Bobby knew he was very sick, but he said he wasn’t ready to cross to Spirit. However, Bobby didn’t know how long he could hang on unless he started to feel better. Nicki assured Bobby that when he was ready, she would help him cross to Spirit. We did Bobby’s first distance energy work session that day. I found that there were a lot of emotional issues that needed to be released (fear, stress, threat, heartache, distrust) mostly connected to the out of control illness that was taking over his body. I spent extra time working with the energy of Bobby’s liver — releasing the discomfort and pressure that was making Bobby so uncomfortable at night. When I talked to Bobby at the end of the session, his energy was much improved — he felt positively perky! Nicki asked when we should do the next session of energy work. I told her that it might need to be the following week or the week after, but I told her that Bobby would tell her when he needed another session. Nicki contacted me by email a few days later with an update. She said that Bobby was less restless at night and that he was more active and seemed happy for the first time in weeks! Nicki was amazed by how much better Bobby was feeling following the energy work and said she definitely wanted to continue the sessions as often as needed. I told her that she should pay attention to Bobby — I was sure he would let her know when he needed more energy work, but my guess was that approximately every 2 weeks would probably be OK for now and that we could always schedule a session sooner, if needed. Bobby received energy work every two weeks from mid-April until the beginning of August. I would talk to Bobby at the start of each session, do his energy work and check in with him at the end of the session. I emailed Nicki everything Bobby told me and what I found when I did his energy work. Bobby’s restlessness/panting at night improved and he had more energy to play and interact with Nicki — even asking for treats and gaining a little weight, which he hadn’t been doing before receiving energy work. We checked with Bobby each time to see how he was feeling and if he needed Nicki to do anything more for him. I adjusted the energy work session as needed, based on what Bobby told me and what Bobby’s body showed me. Bobby was always extra happy on days when he received energy work. Nicki continued to give Bobby Rescue Remedy at night. Bobby slept better and didn’t need the prescription pain medicine at night. At the beginning of August, Nicki noticed that Bobby was getting thinner again and was panting more. He seemed weaker to me and had less energy. Bobby showed me that the pressure in the area of his liver had increased. Bobby said he wanted to talk to Nicki, so we scheduled an appointment just for communication. Bobby told Nicki that he was tired of fighting and was ready to cross to Spirit. Nicki knew that the last few months with Bobby had been a gift — she did not want him to suffer and she told him that she would help him cross to Spirit surrounded by love. Bobby knew that Nicki would help him — they both knew that it was nearly time. Bobby said he wanted to have a few more days to enjoy life. I told/showed Bobby what the euthanasia process would be like — he said he was not afraid and that he would tell/show Nicki when he was ready and that it would be soon. A few days later, Nicki asked me to talk to Bobby again — ” I think it’s time, but I want to be sure. ” Bobby said he was ready to cross to Spirit. He showed me that he didn’t want to wait until he was too weak to walk on his own. Bobby told me that one of Nicki’s dogs in Spirit, a beautiful black Sheltie named Jett, had been visiting him and telling him that it was time to cross to Spirit — but Bobby said he kept saying ” no. ” However, the night before, Bobby had finally had told Jett ” yes ” — he was ready to cross to Spirit. Bobby said that he knew that once he crossed to Spirit he would be strong and beautiful again, free of pain — and he was looking forward to that. Nicki sent Bobby to Spirit surrounded by love, a few days after our last session. Although her heart was breaking to loose her beloved Bobby, Nicki knew that she had done the right thing. I was grateful to have been able to help make Bobby’s last few months more comfortable and to have gotten to know Bobby so much better. Nicki was grateful to have had more time with Bobby, knowing that he wasn’t suffering. ” When my dog’s yearly blood work revealed liver cancer, I worried that he might be frightened or in pain. I immediately contacted Sky. Sky offered insight into Bobby’s feelings and perception of his disease. Sky’s energy work gave Bobby more energy and helped him be as comfortable as possible. Instead of sitting helplessly, worrying and second guessing what I should do, Bobby was able to tell me how he felt, what he needed and wanted when Sky communicated with him. This eliminated the doubt, fear and guilt I’d experience with my previous dogs aged and became ill. When most of us think about thoroughbred race horses, we think of the beautiful horses we see when we watch the Kentucky Derby and other big races that are broadcast on TV. Those equine athletes are a small, small fraction of the the horses that are the product of the horse racing industry. For many racing horses, life is neither kind nor easy. Many are not really able to do the grueling work that is the life of a race horse. If they are lucky, they find a new career. That was the case for Moped, a handsome chestnut gelding. Moped did not have the drive to race. Eventually his owners realized that Moped was not a winner and sold him to a trainer so he could learn a new career — jumping. Moped did the best he could at jumping, but he was too spooky. He was sold again to the owners of a lesson barn that taught both dressage and jumping. They thought he’d be perfect for more advanced riders. About this time, a new rider — a woman named Jan — came into Moped’s life. Jan had recently had to help her beloved horse cross to Spirit and needed a horse to ride and love while she recovered from her loss. The dressage trainer thought that Jan and Moped would be a good match. Jan realized that Moped was special, that he needed the love she could give him and they bonded immediately. Jan rode Moped for many months. She felt that the time she spent with Moped out of the saddle was just as important as the time she spent in the saddle. Moped received more TLC from Jan than he’d ever had from anyone in his life. Moped taught Jan to be a better rider. By talking to Moped, we learned about his experiences at the race track (none of them good) and injuries he’d experienced that had begun to show themselves as he continued with dressage work and a little jumping. He told us how Jan could help him feel better and loved when she massaged his hip, one of his old injuries. Eventually Jan bought another horse — but she was committed to continuing to give Moped the TLC he needed. We talked to Jan’s new horse and explained why Jan would be spending extra time with Moped, so her new horse wouldn’t feel jealous. We also explained to Moped that, while Jan would be spending less time with him and wouldn’t be riding him, she would still spend as much time as she could with him. Moped was grateful that Jan still wanted to spend time with him and said he understood that she needed a horse of her own. Moped knew he couldn’t work at the level of riding that Jan needed. He was sad, but happy that he wasn’t loosing Jan altogether. As time went on, Moped’s behavior became very erratic and unpredictable, to the point that he couldn’t be ridden safely. It became clear that the injuries he’d sustained at the track, plus the body stresses of jumping and dressage were finally catching up with him. One of those injuries was a skull fracture that Moped had sustained when he reared in his stall several years before. As time had gone on, he’d developed a large hard lump at the site of the fracture on his forehead. When I “felt through” Moped’s body, there was a great deal of arthritic pain in his hips and his head felt like he had a continuous migraine. Moped was retired in May of that year. When Moped was outside, he was tormented by the flies and bugs, trotting endlessly around his paddock — becoming more and more frantic trying to escape the biting bugs. Putting Moped in his stall didn’t solve the problem either — he would pace continuously in his stall. He was not at peace anywhere. Without work to occupy his mind, Moped fretted and paced constantly — but he couldn’t be worked because he’d become dangerous to ride. Moped had become dangerous to handle, even for the professionals at the barn. We talked to Moped often during his period of time. Although Moped was always grateful that we took the time to talk to him, there was little we could do to comfort him. Moped did not want to hurt anyone, but he was like a raw nerve due to his headaches. One day Moped suddenly said, “Can I be allowed to cross to Spirit?” Jan and I were both stunned — and then we cried, because we both knew in our hearts that crossing to Spirit was the only way that this poor horse would find peace and freedom from pain. Jan spoke to the barn owners but they were not prepared to put Moped down. They tried very hard to find a retirement home for Moped, but no one wanted a dangerous, unpredictable horse. Finally, they agreed to let Moped cross to Spirit. Jan was given permission by the barn owners and the vet to be present for Moped when he was euthanized. The vet was concerned that Moped’s unpredictable behavior might make it dangerous for Jan to be there — but Jan had a plan. We talked to Moped and I explained the euthanization process, so he would understand and wouldn’t be frightened. I told Moped that when he started to feel wobbly, he should sit down, lay down, then roll over on his side. I told Moped that when he laid down, Jan would come to his head and would be there with him until the end, sending him to Spirit with love. Sitting down is not normal horse behavior, but Moped said he understood that this would keep Jan safe and he was happy she would be there for him. When the day came for Moped to cross to Spirit, Jan stood as close to Moped as the vet would allow. Jan sent loving energy to Moped as the vet gave him the injection that would allow his spirit to leave his body. Jan reminded Moped not to fight the sleepiness, to sit down and relax. Moped remained standing for a few moments . . . then he wobbled a little, sat down and rolled on to his side. Jan knelt by Moped’s head and stroked his neck as Moped took his last breaths, sending love to him all the while. After a few minutes of silence, the vet spoke. 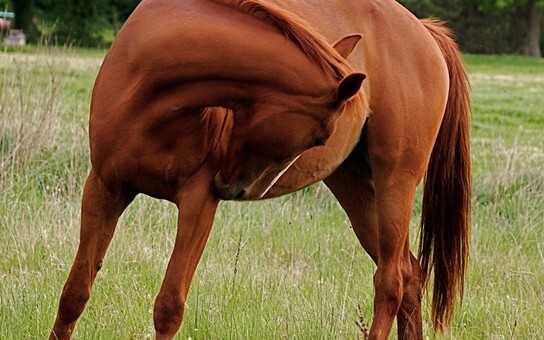 He was clearly stunned — he said he’d never seen a horse sit down and roll over like that. He was shocked that Moped, the dangerous horse, had crossed over so quietly. Jan told the vet that we’d talked to Moped ahead of time — told Moped what to expect and that he should sit down and roll over. The vet just looked at Jan in disbelief — but Jan knew that the talk with Moped had made all the difference. We have talked to Moped many times in the years since he crossed to Spirit. Moped knows how much Jan still loves him, that she will never forget him. Moped feels that Jan is the only person in his whole life who ever really loved him and he has promised to be there for Jan when it is her time to go to Spirit. That’s endless love! All animals do not start their lives in happy, loving homes. But many are lucky enough to be adopted by loving people — if not at their first home, then later in life. To survive the difficult circumstances some animals find themselves in, they often develop behaviors that can be baffling to their adoptive families and challenging to overcome. 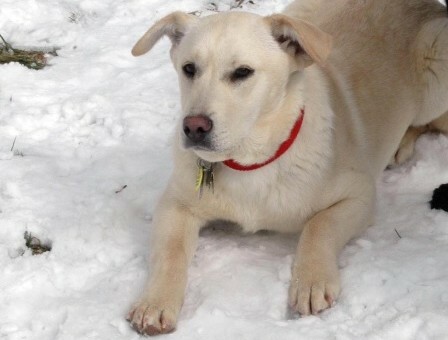 One such dog is Rags, a female lab cross, who was adopted by a loving couple — Taryn and Mike. All the couple knew about Rags when they adopted her was that she came from the southeast USA, that she was brought to the northeast by a rescue organization — and that Rags really, really needed a home. Taryn and Mike were happy to adopt Rags so she could finally have a loving, happy home. But a year after they adopted her, Rags still seemed depressed and unhappy much of the time. She was distant and never wagged her tail. She also displayed a variety of challenging behaviors that the couple had been unable to resolve. Food aggression with their other female lab, Calli, was a big problem. Taryn and Mike described a recent incident to me . . . Rags and Calli were both lying on the floor. Mike put a strawberry down between each dog’s front feet. Calli, who had eaten strawberries before, immediately ate hers — but Rags only sniffed hers and ignored it, as though she did not recognize it as food. Calli looked over, saw the uneaten strawberry and promptly ate it — at which point Rags went after Calli very aggressively. Rags also had a severe phobia of cars — which was triggered when she was walked near cars or when she was in a car. This made fun walks — not to mention trips to fun places or necessary visits to the vet — a complete nightmare for the couple and for Rags. But the most challenging issue was the severe separation anxiety that Rags experienced every time the couple left the house. While Calli was completely fine when they left — Rags literally could not be left in the house unsupervised for more than a few minutes before she began destroying things. The couple loved Rags despite her behavior issues, but that didn’t solve the issues. They sought the help of an animal behaviorist at a major veterinary college, received guidance on behavior modification, which they followed to the letter and started Rags on prescription meds — but these measures did not solve all the issues. In desperation, they decided to try animal communication — they didn’t know where else to turn to help the poor, tortured dog they loved so much. I talked to Rags about her life before she was adopted by Mike and Taryn. Rags showed me that she grew up in a pen crowded with other dogs. She had to fight for every morsel of food. I asked Rags if she got all the food she needed now. She confirmed that this was true. Rags confirmed that she and Calli each had their own food dish — she said that Calli did not eat out of Rags’ dish. I told Rags that Mike and Taryn would make sure that Rags always had enough food and make sure that Calli didn’t eat Rags’ food. Rags said that she understood and would try to remember. Mike and Taryn said they would be sure to feed the dogs only from their bowls, so it was clear whose food was whose. I asked Rags about her fear of cars. Rags showed me that she would cringe and crawl on the ground when she had to be near a car and that she was terrified of getting in a car. Once she was in the car, she would drool and vomit in panic. Mike and Taryn confirmed that this was true. I asked Rags to show me what her experience with cars had been before she was adopted. Rags showed me that she had been tied to the bumper of a car and forgotten — then the car had started to drive away with her still tied to the bumper. Rags had also seen a dog run over by a car. No wonder she was terrified of cars! I asked Rags if anything bad had happened to her in the car since she had been living with the couple. She admitted that nothing had. I asked Rags if she trusted the couple to take care of her — she said she did. I encouraged Rags to remember when she had to be in the car that she was safe and taken care of. I showed Rags what it would be like to relax in the car — to lie down, to look around, to be quiet and relaxed. She said she would try. Next we tackled the issue of Rags’ separation anxiety. The couple said they had tried crating Rags and leaving Calli loose when they left the house. Rags was the one who destroyed things and keeping her in a crate made sense. But that just made the situation even worse! Rags became completely panicked in the crate. I asked Rags how she felt when she was crated — she showed me that she was terrified and that she would do anything to get out of the crate, even if she hurt herself in the process. I asked Rags if she could suggest something that would work better for her. Rags suggested that Calli go in the crate, so Rags could see her, but not have to worry about her. I checked with Calli — Calli didn’t mind going in the crate at all. I suggested to Rags that she pay attention to Calli — if Calli wasn’t worried when they were alone, Rags didn’t need to worry either. Rags said she thought this would work for her. At the end of the conversation, Mike said he had one more question. He said they really wanted Rags to get better. Taryn and Mike both loved Rags SO much, but it was so hard to watch her suffer — and there was no doubt that she was truly suffering at present. They could see how unhappy Rags was and how controlled she was by her behavior issues. With a catch in his voice that could only be tears, Mike said, “Ask Rags if she would rather go to Spirit than keep trying — we don’t want her to suffer.” The fact that Mike asked this question showed me how desperate the situation was for both the couple and for Rags. I asked Rags if she would like to work on getting better or if she was ready to cross to Spirit. The anguish of her emotion was intense — if she had been a person, she would have been crying as she told me, “I love them. I want to try to get better.” We were all crying as I relayed this information to the couple. But we all agreed — we had to give Rags time to try to get better. Six months, five communication sessions and two energy work sessions later and Rags was doing so much better! Her food aggression was a thing of the past. Rags was able to make trips in the car with relatively little distress. At times, Rags still had issues with destructiveness, but even that had improved dramatically. But most importantly, Rags was now a happy dog! She had become affectionate with her people, liked having her tummy rubbed, wagged her tail and happily curled up next to the couple on the couch — none of which she’d done prior to our first communication session! Update on Rags . . . Since my first conversation with Rags in 2011, I have talked with her — and her other furry family members — many times. She still has occasional issues — like the time she kept trying to get into a floor level kitchen cabinet. She told me that she heard something in the cabinet — but when she showed me, it seemed like it was coming from the outside of the wall of the house, which was at the back of the cabinet. Her people couldn’t figure out what she meant — until one day they saw squirrels running down the wood shingles, right against the wall that abutted the cabinet! Whatever is happening with Rags, we talk it over and figure it out. Rags still becomes stressed with changes at home, but explaining what is going on and when it will be over, some distance energy work from me and essential oil application by Taryn and lots of love from Taryn and Mike — and Rags is able to cope. I am so grateful that I was able to help this special dog. But Rags is the one who did the hard work — letting go of her past and learning to trust and love her people. 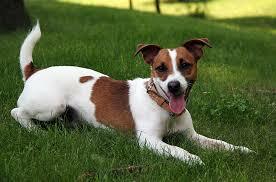 A new client, Mary, scheduled an appointment to talk to her dog Jake, a Jack Russell terrier. Mary was honest with me from the start — she said she’d never done animal communication before and wasn’t really sure she believed in it. I assured her that was OK — it can be hard for a lot of people to believe it’s possible until they experience it. Mary said that she had to crate Jake whenever she left the house because he would destroy the house if she left him out when she wasn’t home. Mary said that Jake never damaged anything while she was home. Mary told me she felt bad about crating Jake and would love to leave Jake loose in the house if she felt confident that he wouldn’t destroy things while she was gone. I asked Jake what happened if Mary left him loose in the house when she was gone. Jake showed me that he would destroy pillows, bedding, couch cushions and pretty much anything else he could get his teeth on with complete and utter joy! It was so much fun for him to do this — the more he could tear things apart, the happier he was! I asked Jake if he thought he could stop destroying things. He was very honest and blunt, “NO — it’s too much fun.” I told him that Mary felt bad that she had to shut him up in his crate when she wasn’t home and that if Jake could stop destroying things, Mary would love to be able to leave him loose in the house. Jake thought about this for a minute and finally told me that he didn’t think he’d be able to stop destroying things — so it was best for both of them if Mary put him in the crate when she was gone — that way, Mary wouldn’t get mad at him and he wouldn’t get in trouble. When I told Mary this, she was non-plussed and said, “Then WHY won’t he go in the crate when it’s time for me to leave?” Mary told me that every time she had to leave the house, Jake would run away from her — it always took 20 minutes or longer for Mary to catch Jake and get him into his crate. This made leaving the house a time consuming and frustrating project that was no fun for Mary and only made her tense and angry. I asked Jake what happened when it was time for Mary to leave the house. Jake showed me that, from his perspective, when Mary prepared to leave the house, it was the signal that it was time for one of Jake’s favorite games — the chase game! Jake showed me that he LOVED the chase game. He was very , very good at the game — zig-zagging around and under furniture, zipping around corners — Mary had to work hard to catch him and Jake loved every minute of it! Jake really didn’t understand why Mary didn’t seem to enjoy the game, since it was SO much fun for him! I explained to Jake that the chase game was definitely NOT fun for Mary. I reminded Jake that Mary took very good care of him — gave him good food, safe shelter, took him to the vet when he needed to go, gave him a great yard to play in, played with him as much as she could and that she loved Jake very, very much. Jake said he knew Mary loved him — she told him all the time. I told Jake that a great way for him to show Mary how much he loved her and appreciated all the things she did for him would be to get into the crate immediately — without playing the chase game — when it was time for Mary to leave the house. I told him that Mary would be happy to play the chase game at other time if he wanted to (Mary happily agreed to that) but when it was time for Mary to leave, he needed to get right into the crate. Jake gave this plan serious thought. Finally he said, “Could I get a treat if I go right into the crate?” I checked with Mary and she said, “If he goes right into the crate when I tell him it’s time to go in the crate, he can definitely have a treat!” I told Jake this and he said, “Could I have three treats?” Again, Mary said three treats was acceptable — as long as he went right into the crate. I told Jake three treats was OK with Mary. Jake then told me when he wanted the treats to be given. He showed me that he wanted one treat when he got to the door of the crate, then he would go in the crate. He wanted the last two treats when he was inside the crate. I told Mary when Jake wanted to be given the treats. She said, “Fine — as long as he goes in the crate and stays in the crate!” Jake said he would stay in the crate if he was given his three treats. At this point Mary seemed a little distracted and asked if I could hold on for a few minutes. I told her I could — I assumed that the door bell had rung or her cell phone was ringing. Mary left the phone and I waited. When Mary got back on the phone, several minutes later, she apologized for making me wait. She said, “I’m sorry, but I had to try to get Jake in the crate. I couldn’t believe it would actually work, but it did!” Mary told me she told Jake he had to go in his crate. She said Jake went right to the door of the crate and waited there, looking at her expectantly. Mary gave Jake one treat and he went right into the crate. Mary gave Jake two more treats and he stayed in the crate when Mary closed the door! Sometimes coming up with a solution for an animal’s behavior issue can be a matter of changing their (or our) perception of the issue, giving the animal emotional support, adjusting circumstances to make it easier for the animal to behave appropriately or — as in Jake’s case — making a deal. Whatever works is the right solution! I was at a metaphysical fair in CO this spring and a woman who looked familiar sat down at my table. I was happy to find out that she was Sue Z. — the woman who had asked me to talk to the elephants in the Sheldrick Wildlife Sanctuary in Africa in 2012. Sue wanted to check in with one of the elephants we’d talked to previously — a female elephant named Sities. The first thing Sities said when I connected to her was, “I’m a BIG girl now!” She showed me that she was no longer in the nursery and was now living with a herd of elephants in the “wild” part of the sanctuary. Sue confirmed that Sities had indeed “graduated” to living with a herd outside the sanctuary compound. I asked Sities what it was like living with a herd . . . she flooded me with feelings of how wonderful it was for her. It didn’t matter that this was not her biological family, they welcomed her in and treated her like she belonged, like she was a part of them, without hesitation. Sities said, “I have a family now.” Her joy at knowing and feeling this was overwhelming — as I felt her joy, I began to cry. Sities showed me that her favorite thing was when all the elephants would stand close together in a tight group, completely surrounding her . . . the other elephants touching her, caressing her all over with their trunks — while she touched them in the same way. Sities said, “I feel safe and loved now”. It was unbelievably touching and powerful to experience this from Sities’ perspective. Sue asked if Sities was ever visited by her caregiver from the nursery. Sities said that her caregiver did visit her. Sities said that she always knows when he is near — he does not get too close to the herd — and she always comes running to see him! Sities said that “her friend” (the caregiver) always brings her a special treat (it appeared to be sort of like a flat biscuit-like treat) and that he rubs her head in the way she likes. Sue confirmed that this is the way that the caregivers interact with the elephants once they are released to a herd — and confirmed that the special treats are what Sities showed me. Sue wanted to know how Sities was feeling about her Mother’s death, now that some time had passed. Sities said she was no longer sad because her Mother has been coming to visit her in Spirit. Sities said, “My mother is beautiful again and has her long, beautiful tusks back. She said she is safe and happy now.” Sities showed me that when her Mother in Spirit visits her, that they stand very close together — loving energy flowing between them. I thanked Sities for talking to us and asked her if there was anything else she wanted us to know. Sities thanked us for talking to her and said, “It’s good to know that people we (“we” meaning elephants in the sanctuary) don’t even know care about us.” This too touched my heart deeply and brought tears to my eyes. Sue then asked if we could talk to a male baby elephant named Jasari. When I connected to Jasari, I felt he was young and small compared to the other baby elephants in the nursery. Sue confirmed that this was true. Sue asked me to see if Jasari remembered how he came to be at the sanctuary. He showed me that he remembered standing next to his mother, then feeling frozen in place (to me it felt like he was in shock). Much later, Jasari remembered was that he was lying on the ground — he said he remembered men standing over him and then loosing consciousness. The next thing Jasari showed me was being in an enclosed space that was bouncing around. Jabari said there were people with him, “They were nice and trying to help me. They wanted me to live.” After a very long ride, Jasari came to the sanctuary nursery. Sue confirmed that Jasari was found a very long way from the sanctuary, that he was transported to the sanctuary by plane and truck and that he almost died. I asked Jasari if he liked living at the sanctuary. He showed me that he was nervous at first. But Jasari showed me touching everything with his trunk (the walls, the floor, the bedding, the food, the people) and finally he knew he was safe! Jabari told me that the people at the sanctuary were nice and that the food was always good! He said he was very happy at the sanctuary. 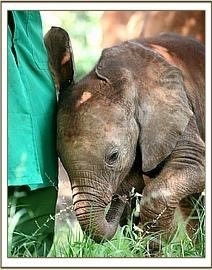 You can foster an elephant or rhino for as little as $50.00 year. I met Sue the first time at a metaphysical fair in Colorado. She was visibly upset and concerned. 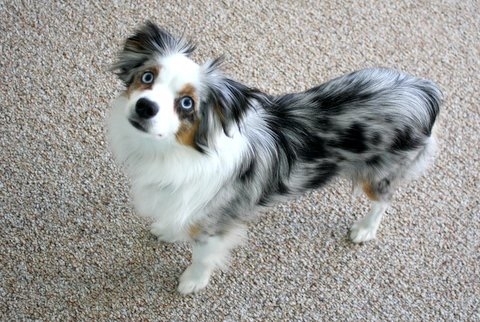 Sue told me she had recently adopted a toy Australian Shepard named Rayme. Sue said that her previous dog, Austin, had crossed to Spirit not long ago. Sue was concerned because she didn’t feel she and Rayme were bonding well. I asked Rayme how she felt about living with Sue. Rayme showed me that Sue cried a lot — Rayme felt Sue’s heart was broken and she didn’t know what to do about it. Sue admitted that she was still grieving for Austin, who she was deeply attached to. Sue said she cried for several reasons — the heartache she felt now that Austin was gone, painful family/relationship issues and because she didn’t seem to be bonding with Rayme. Rayme showed me that she would stand a distance from Sue and just watch her, not knowing what to do. Sue confirmed this was exactly what was happening — it was heartbreaking to Sue. It felt to me that there was a “barrier” between Rayme and Sue, which Rayme also felt. I asked Rayme to show me the “barrier”. What Rayme showed me was the spirit of Austin standing in front of Sue — always between Sue and Rayme. I talked to Austin, in Spirit. Austin was upset by the way Rayme was treating her beloved person, Sue. She felt that Rayme was making Sue cry and that Rayme was not being loving to Sue. This was very upsetting to Austin, who loved Sue deeply, so Austin was standing guard over Sue, trying to protect her from the unloving behavior Rayme was exhibiting. Clearly, there were several misunderstanding contributing to the situation! I told Austin that we certainly understood her concerns for Sue’s feelings and that Sue was grateful for her protection. I told Austin that as much as Sue appreciated Austin’s intentions, it was important for Sue and Rayme to be able to bond. I asked Austin if it would be possible for her to stand next to Sue, rather than in front of Sue — which would allow Rayme to connect with Sue. I asked Austin if she could just observe Rayme and Sue’s interactions and encourage Rayme to connect with Sue. I told Austin that this was what Sue wanted — a deeper connection to Rayme — although no one would ever replace Austin in Sue’s heart. Austin agreed to step aside and make room for Rayme. I let Rayme know that Austin was going to stand aside and that she could now connect with Sue. Rayme was concerned that Sue was disappointed in her and that was why Sue cried. I told Rayme that Sue went into the bedroom to cry for many reasons. I encouraged Rayme to give Sue space and time to cry if she needed to and when Sue came out of the bedroom, I showed Rayme how she could greet Sue happily and know that Sue would be happy to spend time with her then. Rayme said she understood and that she would do that from now on. Sue was still concerned that she and Rayme were not bonding. Sue asked me to ask Rayme, point blank, if Rayme wanted to be her dog. Rayme said it was more fun when she first came to live with Sue, that Sue didn’t play with her any more, but Rayme didn’t understand why. Sue told me that she’d recently injured her hip, so she couldn’t play with Rayme like she had at first. I explained to Rayme that Sue had hurt herself and couldn’t play like she had before. Rayme said, “I’m not hurt — how long until she can play with me again?” I told Rayme that it would be “a few moons” (months) before Sue could play actively again. I reminded Sue that Rayme was a puppy and really needed the exercise and play — we brain stormed and came up with some activities that Sue could do with Rayme that would be fun and active for Rayme, but wouldn’t further stress Sue’s injury. Rayme said that as long as Sue played with her, she would be able to wait until Sue healed to play more actively. Sue agreed to play more safe games with Rayme and said she was hopeful that she and Rayme would begin to bond now that they both understood each other better. We have talked to Rayme many times since that first conversation at the fair about a variety of issues . . .
— When Rayme was about 5 months old, Sue asked me to check with Rayme to see if she still needed to be crated when Sue left the house or if it was Ok to leave her loose in the apartment’s large bathroom. Rayme proudly informed us that she was “a big girl now” and would not have accidents in the house. Sue reported that Rayme never had any accidents when she left the house after that conversation. — When Rayme was 6 months old, Rayme and Sue were going to move to Florida. Sue and Rayme were going to travel to Florida by plane, so we needed to explain an airline flight to Rayme. Initially I thought Rayme would be traveling in cargo — Rayme said, “I’ll be scared, but I know I have to be a big girl and be brave.” Sue corrected me and told me Rayme would be traveling in the cabin with her. Rayme said she liked that much better! I told Rayme she would have to be very quiet and still. Rayme promised to be a “good girl”. Sue reported that Rayme “did not make a peep” during the trip! The passengers around Sue couldn’t get over how well behaved Rayme was, even when she was laying on Sue’s lap, not making a sound! — A few months ago, Sue got a dog agility-type tunnel for Rayme to play in — but Rayme seemed to be afraid of it. Rayme said she knew that Sue really wanted her to go in the tunnel and showed me running through it as fast as she could. Sue confirmed that this was exactly what Rayme did. Rayme said she was trying to be brave, but that it really scared her when the tunnel shook when she was inside it. I suggested to Sue that Rayme might be more willing to go in the tunnel if it was stabilized and didn’t move so much. Sue agreed to brace the tunnel so it didn’t move. Rayme was happy to hear this and said she would go into the tunnel now. Sue stabilized the tunnel and the next morning she threw a toy into the middle of the tunnel. Rayme not only ran right in to get the toy, but stopped in the middle of the tunnel,sat down, dropped her toy, picked it up and went out the other end of the tunnel. Sue reported that Rayme had never done this before! Rayme was never afraid of the tunnel again. Rayme will be a year old on May 13th. With the help of good communication, Rayme and Sue have a bonded and loving relationship! Ann was desperate. Her cat Missy, an indoor/outdoor cat who stayed in at night, was peeing in the kitchen and in the downstairs hall at night. Missy rarely meowed, but she would find paper to shred or knock over objects until Ann got up in frustration to see what Missy needed. Missy was waking Ann up 2 or 3 times a night. This had been going on for three long years and Ann didn’t know what to do. A friend of Ann’s, who was a client of mine, suggested that Ann try communicating with Missy to try to resolve the issue. Missy let us know immediately where she stood — she said she was the “top cat” (Ann has two other cats) and “the queen of the house.” Ann said that this completely matched Missy’s attitude with the other two cats and with Ann as well. Ann asked me to see if Missy felt she had a urinary issue. Missy didn’t “point” me at any physical problems and I didn’t feel anything when I “scanned” her body. In fact, Missy seemed a bit insulted that we would think that there was anything at all wrong with her. Ann said she’d had Missy checked by the vet and the vet didn’t feel Missy had any urinary issues either. So what was the cause of the night time urination? Ann said there were several litter boxes in the house and that she kept them very clean. I asked Missy about her feelings about the litter box. Missy was very clear — “Why would I use the litter box? It just makes the room smell.” Missy also didn’t like the texture of the cat litter Ann was using. Ann said she would try a different cat litter and hopefully Missy would like that better. I told Missy that she needed to be very, very sure to only use the litter box at night. I showed Missy the picture of the behavior we were looking for and Missy said she would try. I reviewed what Ann should do to reinforce the behavior we were wanting from Missy (using the litter box at night) — talking/visualizing to Missy the behavior she wanted NOT what she didn’t want. Ann said she would follow through with her part of the agreement. I told Ann I couldn’t guarantee that Missy would change her ways, Missy had free will after all, but I hoped that Missy would comply. Ann said she understood. About 3 weeks later, Ann contacted me again. She was at her wits end. The good news was that Missy hadn’t peed in the house at night since out last conversation, but Missy was continuing to make noise at night and wake Ann up 2 or 3 times a night. Ann was afraid that Missy would pee in the house, so Ann was continuing to get up each time Missy made noise and tried to figure out what Missy wanted . . . Food? Pets? To go out? Ann said she hadn’t had a decent night’s sleep in years and she just couldn’t take it any more. I asked Missy if she was hungry during the night. Missy said she didn’t like the wet food that was left out at bed time, “I don’t like old food. The [wet food] in the kitchen at night isn’t fresh.” Ann was getting up and giving Missy fresh wet food, even though there was dry food available. Missy also said she wasn’t particularly hungry at night. Missy showed me that she would eat a little of the wet food Ann put out for her, but without much enthusiasm. Ann confirmed that when she got up and gave Missy additional food during the night, Missy would just pick at it and not eat much. So obviously Missy was not waking Ann up because she was hungry. I asked Missy if she woke Ann up because she wanted to go out. Missy said that since Ann was willing to get up, she was happy to have the chance to pee outside. But it did not feel to me that Missy was desperate to go out to pee. I explained to Missy that even though Missy was awake at night, Ann needed her sleep. Missy said that was silly — Ann should just take naps during the day like Missy did. I told Missy that it didn’t work that way for people — people needed to be awake all day and they needed to sleep all night. I reminded Missy that because Ann wasn’t going to be getting up to let her out, she needed to either pee in the litter box or hold it and go out in the morning when Ann got up. Missy was again clear with her feelings — “I’ll just hold it and go outside in the morning.” But she said she wouldn’t pee in the house anymore. A few weeks later I heard back from Ann. Not only had Missy continued to “hold it” at night and pee outside in the morning, but Missy had not once made noise at night and woken Ann up! Ann reported that Missy had been sleeping on the bed with her and didn’t even get off the bed when Ann got up during the night. Ann was finally getting the rest she needed and Missy was cooperating. Ann could not have been happier and Missy was happy and content too, now that she understood that Ann wasn’t going to get up to entertain her at night. Whether the dead animal is a wild animal or a domestic animal, most of us react the same way — we feel sad for a life cut short and ended so violently . . . we wish there was something we could do to help. I always encourage people to send love to the spirit of the animal, to visualize the animal’s spirit surrounded by White Light (or whatever color feels right to you) and to ask whatever Higher Powers you believe in to help the animal’s spirit successfully cross over. Because of my connection to the animals, I often find spirits of animals killed on the road asking me for help. The feeling starts in my 3rd eye — a persistent feeling that needs attention — and it does not let up until I make connection to the animal. It’s like the animal’s spirit is suddenly there in the car with me. The first time I experienced this, it was more than a little surprising. It doesn’t happen with every animal, only those whose spirits have left their bodies, but have not crossed to Spirit. This is not an unusual occurrence when a death is sudden and traumatic, as in a road accident. When the animal spirits demand my attention, I do what needs to be done to release them so they can cross to Spirit. A few years after I started talking to animals, I had a particularly vivid experience with this. I was driving west on Rt. 80 in Pennsylvania. It was the beginning of dusk — still quite light, but not bright day. I came over the top of a low rise and I saw on the road ahead of me a black triangle — the near edge of it went all the way across the road, then tapered to a point on the edge of the right shoulder of the road. I looked ahead to where the far point of the triangle terminated and I saw a bundle of . . . dead animal. The only clue that told me this was a deer was one single hoof that was undamaged. At that moment, I crossed into the black triangle. It was like I was inside a movie. I saw and felt what the deer experienced . . . the giant semi tractor trailer slamming into the deer/me as the deer/I bounded across the highway, being dragged for what felt like an eternity, the deer’s body/my body jammed between the front bumper and the wheels, eventually chewed up and spit out by the giant wheels . . . the pain, the shock, the unending terror. As I passed the remains of the deer, the vision stopped — and I was again driving my car. I was so shaken up by this experience that I had to pull over and calm my shaking body. I looked back over the road — there was no black triangle visible. When I stopped shaking and could be calm again, I realized I had to help the spirit of the deer, who was clearly “stuck”. Taking a deep breath, I connected to the deer’s spirit. The deer was in panic and agony — she couldn’t understand why this had happened and kept re-living the experience over and over. I sent the deer unconditional love, White Light and compassion for what felt like a very long time. Finally, I felt the deer begin to calm. I told the deer that she needed to cross to Spirit. She said, “I can’t stay here, can I? It doesn’t do any good to stay here, does it?” I told her no, that she would be much better off if she crossed to Spirit. I showed her what the animals always show me they feel when they cross to Spirit — the feelings of the most intense love, peace, joy and freedom. I told her that is what awaited her if she could cross to Spirit. Finally, she said she was ready to cross to Spirit. I asked her if she could cross alone, or if she wanted me to call for another animal spirit to go with her. She asked for another animal spirit . . . and a rabbit appeared. I watched the vision of the spirits of the deer and the rabbit as they ran up the green, grassy hill into the sunrise. As they crested the hill, I knew she was safe in Spirit. Then I connected with the doe in Spirit. She said she was sorry she had waited so long — that Spirit was a beautiful place — “the most beautiful place there is.” She said no one should have to suffer as she had when she was killed and then “stuck”, unable to cross to Spirit. I promised her that whenever I found an animal who was “stuck” that I would do everything I could to help them cross to Spirit. She thanked me and said, “We all thank you”. I continue to help release animals to Spirit when they are “stuck” whenever they come to me for help. If you feel moved to do so, please do what you can to help them too! Kayla asked me to talk to her dog, Ranger. When I started talking to Ranger, the first thing he said was that he “wanted to be a good dog” for Kayla. Kayla said Ranger was a very, very good dog — she loved him very much. When I told Ranger that, he was so happy! He said he was grateful to have someone who loved him, finally. Ranger showed me that he’d not had very much love or consistency with the family he was with when he was young. Ranger came to Kayla a few months before from a canine/inmate program at a prison. Ranger worked with at least two prisoners — the first one was new to dog training and wasn’t sure what he was doing, but Ranger said they learned together. Ranger said that the prisoners were kind to him, but he knew that neither of them were “his person”. Ranger said that his prison trainers told him that they were training him “to be a good dog so he could get a good home”. Ranger said he worked hard to learn everything and become a good dog, so he could find someone who would love him. Kayla reported that Ranger was an amazingly good dog — very obedient, happy and a wonderful companion . . . until she was out of the house for work. Kayla’s main concern was Ranger’s severe separation anxiety. Kayla said that she crated Ranger when she left the house (he was crate trained in the prison program) and always came home to check on Ranger at noon and let him out and would be home at the same time in the afternoon. Kayla said that she was very consistent about the times she came home. Despite this, Ranger was showing increasing signs of anxiety when Kayla left him. When I asked Ranger about this, he said that he was very worried that Kayla would not come back. Each time she came home, it was a miracle to him — he was so afraid that she wouldn’t come back! My feeling was that this anxiety was related to Ranger’s past. When I asked him about it, he said that the family he was with when he was young would often leave, come back and then leave again right away and be gone for for long periods of time. He never knew when they would be home to stay. Ranger showed me that he was calm all the time — except when Kayla left. Ranger knew he could trust Kayla completely, but when he became anxious, Ranger was not thinking clearly. It was clear to me that Ranger didn’t even understand that it was possible to step back from the anxiety once it started. Ranger showed me that when he was over come with anxiety it was actually painful to him. The next step was figuring out how to help Ranger learn he could be calm and relaxed all the time. I always like to start with simple things first. I made several suggestions including flower essence blends for calming and fear and having a dog walker come in the afternoon to get Ranger out for some exercise and suggested Kayla visualize Ranger being calm. I also suggested that Kayla try a Thundershirt for Ranger. A Thundershirt is a vest that applies pressure to acupressure points associated with calming/release of anxiety. Thundershirts don’t work for every animal, but it was certainly worth a try! Kayla was willing to try anything to help Ranger and implemented the suggestions as soon as she could. I received an email from Kayla the next day . . . Ranger’s anxiety had continued to escalate — he had tried frantically to get out of his crate and had even bent the bars of the crate trying to escape. Kayla didn’t know what to do to help Ranger. As I read Kayla’s email, it was clear to me that Ranger’s anxiety was way beyond his control. Much as I prefer a more homeopathic solution, there are times when prescription medication is what is called for — I felt this was one of those times. I suggested that Kayla contact her vet to see if a mild calming prescription would be possible for Ranger. I suggested Kayla be clear with the vet that she did not want to sedate Ranger, only allow him to have decreased anxiety so he could learn that he did not have to be anxious. My hope was that if Ranger could understand that it was possible not to be anxious, that he could eventually get off the prescription med and even be allowed free in the house. Kayla got in contact with the vet as soon as possible and started Ranger on the medication right away. We talked to Ranger again less than two weeks later. The first thing Ranger said was, “Now I’m a really good dog!” Ranger showed me that he didn’t worry any more in his crate — he showed me that he slept and relaxed. Kayla said she only gave the prescription med to Ranger when he would need to be crated while she was at work. He said he felt a little “dull” when he got the medicine — “but that’s better than worrying — I didn’t know I could not worry!” He was very, very happy not to be feeling the extreme anxiety any more! Kayla said that she had also gotten Ranger a Thundershirt, which Ranger loves! She said that Ranger was a bit worried the first couple times she put it on him, but within minutes, he was happy and wagging his tail. Now, he happily lets her put the Thundershirt on and even gets excited as soon as he sees it! I asked Ranger how the Thundershirt felt — the feeling he showed me was that it felt like a hug! ” After we talked to Ranger the first time, when his anxiety got worse, I emailed Sky for advice. Sky didn’t hesitate to give me ideas and help me understand what Ranger needed. She truly went above and beyond for Ranger and me. She treated Ranger as if he was one of her own and genuinely cared about him! I could not be happier with Sky and everything she did for us. We are both so grateful for all the help Sky has given us! ” — Kayla L., CO. I love talking to new breeds and species and in September 2014, I got the opportunity to talk to a parrotlet! Parrotlets are the smallest species of parrot. Even though they are small, they have plenty of personality! Allison and her daughters and I had talked to their horses and cats a few times, but in September, Allison was very concerned about one of their four parrotlets, Lakota. Lakota had been plucking and chewing the feathers on her chest, back and legs for several months — to the point that she had bare, raw areas on her chest and back. [The photo on the left is of Lakota at that time.] They had taken Lakota to the vet, but Lakota was completely healthy. The vet had no explanation for Lakota’s self destructive behavior and suggested hormone shots, but Allison was very reluctant to do this. Instead, Allison contacted me about talking to Lakota. Alison’s daughter, Calista, is Lakota’s person so I was very happy that Calista was going to be on the phone to ask the questions and hear the answers. Allison and Calista were sitting in the car and Lakota was with them — climbing all over Callista as we talked. As soon as I connected to Lakota she started talking. I kept having to ask Lakota to wait so I could relay the information to Callista and Allison — Lakota was talking non-stop! Lakota said that she was upset and unhappy— her energy was very tense and angry. The problem wasn’t Callista, her food, her cage, her mate or the amount of attention she received. What she was unhappy about was Ladybird — the female parrotlet in the cage next to Lakota’s. Lakota said she had to be on guard all the time — she couldn’t relax. Lakota showed me that she was pacing all the time. Callista confirmed that Lakata did pace all the time in her cage. I asked her why she felt she had to be on guard. Lakota said that she had to protect her mate, Disco, from Ladybird. She wasn’t afraid Ladybird would hurt Disco — she was afraid that Ladybird would take Disco. Despite Lakota’s statements, she did not show me that Ladybird was being aggressive or doing anything to harm Lakota or Disco. Alison and Calista confirmed that this was true. I asked Lakota if she trusted her people to take care of her. Lakota said she did trust them and loved to play with Callista. I asked Lakota if she could trust her people to keep Lakota and her mate safe and protected — that it was Lakota’s people’s job to keep her and her mate safe and that Lakota could trust them to do this, now that they understood how worried she had been. It took some convincing, but finally Lakota was relieved that the responsibility for her and her mate’s safety was no longer on her little feathered shoulders — I felt a deep mental “sigh” — and she agreed to trust her people to keep her safe. Next we asked about the feather chewing/plucking. We asked if Lakota thought she could stop doing this now that she knew she and her mate would be safe — Lakota said yes. As with all behavior changes, I needed to suggest something for Lakota to do when she gets the urge to pluck her feathers. Calista said that Lakota had toys in her cage but never played with them. I asked Lakota why she didn’t play with her toys and Lakota said she thought she wasn’t allowed to “because I have been so busy trying to keep Ladybird away.” In other words, if she played with the toys she would relax her guard and she couldn’t do that because it wasn’t safe. I reminded Lakota that her people would keep her safe now, so she could relax and play with her toys — especially when she felt like plucking her feathers. She said she would do that. Allison and Calista also asked me to see if I could get Lakota to eat her vitamin supplement, which were always in the container at the bottom of her cage. Lakota knew where the supplement was, but wanted to know why she should eat them. Calista said it was because they wanted Lakota to be a strong bird and live a long time. Lakota said she was already a strong bird, even though she was little — but agreed to eat the vitamins and she agreed to tell her mate to eat them too. At the end of the session, Lakota’s energy felt much better — she was relaxed and happy! Calista reported the each time I spoke to Lakota, she would pause in what she was doing and appeared to be listening. When I would start talking to Calista and Allison, Lakota would continue whatever she had been doing. They were amazed to watch her response! ” Lakota stopped plucking and chewing her feathers immediately after our phone call with Sky. We moved Ladybird and her mate’s cage to the other side of the house as Lakota requested. Since then Lakota has stopped pacing, regularly plays with her toys and now eats her vitamins — And even got her mate to eat his too! Lakota is one happy bird! If you have a bird with a behavior problem, it may be a simpler fix than you realize. Please call Sky — she helped us and our sweet little Lakota tremendously! ” — Allison W., CO.